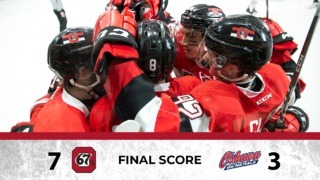 The Ottawa 67’s exploded for eight goals in the final two periods to pick up a decisive 9-3 win over the Hamilton Bulldogs to kickoff their first-round OHL playoff series on Friday night at The Arena at TD Place. 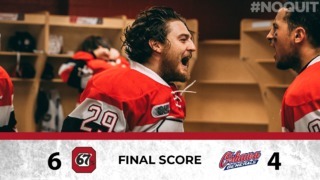 Now leading 1-0 in the best-of-seven Eastern Conference Quarter-Finals, the 67’s broke open a game that was deadlocked 1-1 after 20 minutes as the Barber Poles quickly dispatched any possible post-season jitters with a dominant second-half to this game. 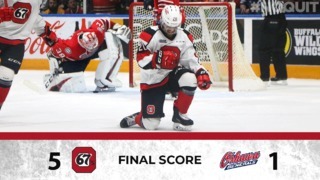 Mikey DiPietro made 27 saves in goal for Ottawa, the top team in the OHL this season, while the 67’s got two-goal performances from Sasha Chmelevski, Kyle Maksimovich and Graeme Clarke in a game that left a boisterous crowd at The Arena at TD Place chanting “we want 10!”. Kody Clarke and Noel Hoefenmayer, with a goal and an assist each, and Nikita Okhotyuk also scored for Ottawa in Game 1. Lucas Chiodo, with three assists, and Austen Keating, with a pair of helpers, both had multi-point nights for the home team. The Bulldogs, who stayed in it early but were hurt by repeated trips to the penalty box, got goals from Eric Henderson and Matthew Strome to briefly give them a second-period period lead. Kade Landry added one midway through the third with the game already heavily tilted in Ottawa’s favour. The 67’s and Bulldogs will square off again on Sunday afternoon when the puck is dropped for Game 2 at 2 p.m. at The Arena at TD Place. “It’s natural to come out a little sluggish. I think we stuck with it, the second half of the second period we played with a lot of pace and that’s what flipped it. We felt the intensity from the crowd, there was a buzz that really pushed us and everyone had a little more pep in their step tonight. I don’t think the result has anything to do with the series. They have a strong team, they’re relentless and Game 2 is going to be just as much of a battle. Kyle Maksimovich, with a goal and an assist in the game, also led both teams with eight shots. The 67’s took advantage of seven powerplays given to them by Hamilton, scoring on four opportunities. 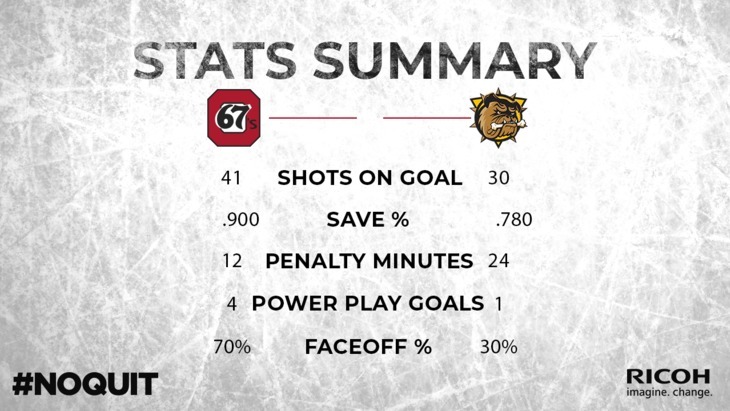 The 67’s outshot the Bulldogs 41-30 and held a 56-24 edge in the face-off circle. Sasha Chmelevski and Nikita Okhotyuk were a game-high plus-three on the night. Attendance for Game 1 in Ottawa was 5,000.